Advanced, Programmable, Single Phase Power Sources. Adaptive Power Systems offers a wide range of programmable AC Sources, DC Power Supplies and Electronic Loads. With local sales, support and service centers around the world, we are ready to serve your power test needs. Our customers always come first! New range of Medium to high power AC and DC capable electronic loads with support for up to 350Vac and 500Vdc input voltages. 1875VA/W to 22,500VA/W. Built-in UPS, PV Inverter, Battery and AC rectifier test modes. 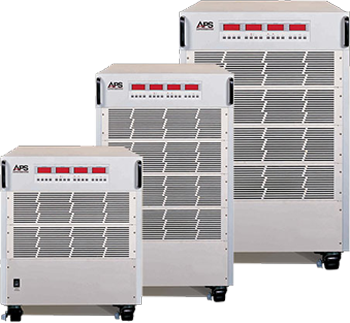 Find out how affordable it can be to configure AC power test systems for your product test needs using APS Frequency Changers. 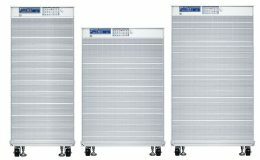 Available in single or three phase output modes to power levels of up to 180KVA. Our AC Power Sources frequencies and voltages found around the world and in military avionics/shipboard applications, accept multiple frequency and voltage inputs, offer fully adjustable output frequency and a very broad adjustable voltage range that permits the duplication of worldwide utility configurations. Adaptive Power Systems offers an extensive line of programmable electronic loads for DC and AC load applications in R&D, ATE and Production. Our loads offer leading edge features and capabilities for a wide range of voltage, current and power needs. Available in power levels starting at 150W all the way to100’s kW. Easy front panel operation and GPIB, USB and LAN interfaces support both Lab and ATE. 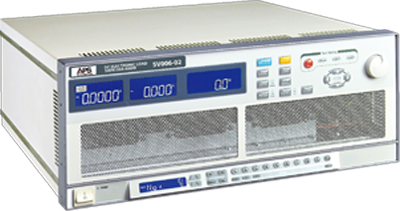 Our selection of precision programmable DC Power Supplies starts at 5kW and ranges to 480kW. Voltage ranges up to 1500Vdc are available. Some model series offer two-quadrant, regenerative operation for sourcing and sinking dc current using a single instrument using energy recovery to the grid. The high demands placed on large battery packs for hybrid and full electric vehicles requires testing using an advanced electronic DC load. The APS 5VP Series of high-power, programmable DC loads addresses the growing for high speed dynamic transient load testing of large batteries. Supporting five different built-in battery test profiles and power levels up to 60KW per chassis, the 5VP Series is unmatched for these applications. For higher power needs, multiple 5VP Series loads can be used in Master/Slave parallel mode. Battery packs to 1000 Vdc are supported.